Are there any gay players in the NHL? We don’t know. Nobody in the NHL has come out and publicly said they are gay. Will there be a hockey player who comes out and openly says he is gay? How will his teammates, coaches, management, owners and fans respond if this happens? But if a player does happen to come out, one group, along with several big name players, are trying to help their experience. A public service announcement recently aired on NBC during a Boston Bruins/New York Rangers game aimed at ending homophobia in sports. Some of the NHL’s top players, including Henrik Lundqvist, Corey Perry, Claude Giroux, Daniel Alfredsson, Rick Nash, Joffrey Lupul, Scott Hartnell, Matt Moulson, Duncan Keith and Dion Phaneuf all appear in the video, which basically tells viewers if you can play the game, you can play the game, it doesn’t matter what your sexual preference is. Toronto Maple Leaf’s general manager Brian Burke and his son Patrick, a scout for the Philadelphia Flyers, are leading the program that wants to let gay athletes know that is it okay to be gay. The campaign is intended to “make locker rooms safe for all athletes, rather than places of fears, slurs and bullying.” Thirty-five NHLers are committed to the project. 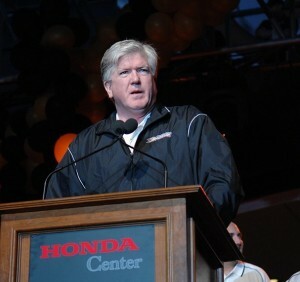 The Burke family jumped on this campaign after Brian’s son, Brendan, acknowledged that he was gay in 2007 during the time he was manager of a college hockey team. He came out in public in 2009 and was also working on spreading a message of tolerance and inclusion in the hockey world. After his coming out, Brian and Brendan marched together in gay pride parades in Toronto. Brian had accepted Brendan’s sexual preference. In 2010, the Burke family was hit with sad news when they learned Brendan had died in a car accident. After the accident, Brian still marched in the parade. And he is still marching on behalf of Brendan. Hockey overcame the racial barrier when Willie O’Ree, the first black player in NHL history, laced up his skates for the Boston Bruins in 1958. The NHL has yet to break the homosexual barrier. But the “If You Can Play” project is hoping to change that. On the campaign’s website, Patrick explains that his brother Brendan taught him what it was like to be in a locker room as a gay male. He says the project aims to provide a means for athletes, coaches and fans to stand up and create an atmosphere of inclusion. He wants athletes to become aware that it doesn’t matter if they are gay, they can still be athletes. He hopes that athletes will eventually be free from the burdens of fear and shame, and thus, able to play to their full potential. He says it’s time for the world to change the way it thinks about athletes. Talent, work ethic and character are what matter­—not sexual orientation.